Many of us know the anecdote of the composer with the rebellious son who could always annoy his father by playing an incomplete scale on the piano. No matter what occupied the composer at the time, he would go to the piano and complete the scale himself. True or not, the story testifies to our need for completeness. 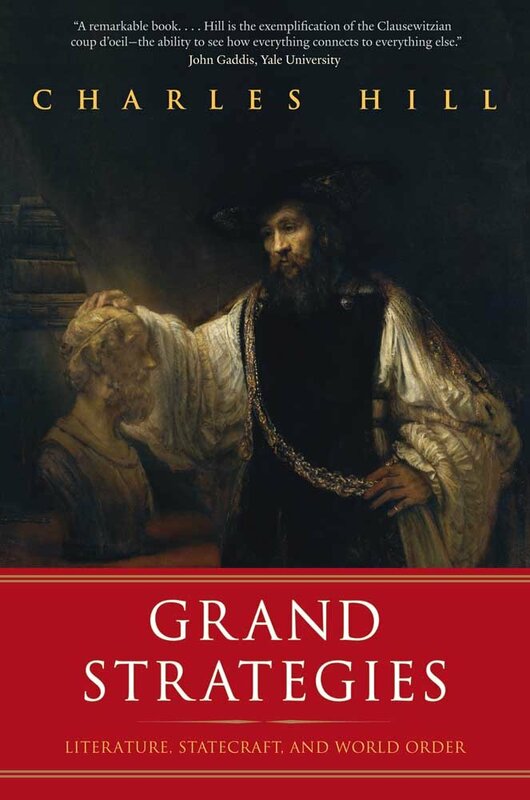 Reading Charles Hill’s Grand Strategies: Literature, Statecraft, and World Order made me think of this story, but with a slight twist. I imagine Hill at the piano playing a complete scale, but with the last note much quieter than the others. It’s there, but so faint that one would feel bound to go the piano and play the final note at its proper volume. Meaning and wholeness requires balance, symmetry, and perhaps also, a strong finish. I put a proposition to you all: we have entered a time of total change in human consciousness of how people look at the world. Reading books requires you to form concepts, to train your mind to relationships. You have to come to grips with who you are. A leader needs these qualities. But now we learn from fragments of facts. A book is a large intellectual construction; you can’t hold it all in your mind all at once. You have to struggle mentally to internalize it. Now there is no need to internalize because each fact can be called up instantly on the computer. There is no context, no motive. Information is not knowledge. People are not readers, but researchers, they float on the surface. Churchill understood context. It disaggregates everything. All this makes strategic thinking about the world nearly impossible to achieve. Hill impressed me with the idea behind his book, and he displays a wide knowledge of western civilization’s literary heritage. Many times I marked pages where I gained fresh insight and had my perspective challenged, but in the end the book left me frustrated at the missed opportunities Hill leaves on the table. He conveys the message that great literature helps us understand the world and ourselves, but this note strikes me as far too wimpy and obvious given what the book could have achieved. As Kissinger mentioned, statesmen should prioritize context. Hill does a good job with this in his section on ancient literature. He weaves in Aristotle’s assertion that the family gives the state its foundation, and then looks at the Illiad and the Odyssey, which have marriages at their center. He fans out to Aeschylus, whose Oresteia trilogy has the breakdown of family bonds nearly destroy the state. He traces this up through De Tocqueville, who saw family, and especially women and mothers, as bulwarks of the familial stability needed for any state. But democracies in particular need family stability due to their decisive emphasis on individual rights. Hill makes the importance of context brilliantly in his section on Walt Whitman. If we know the opening lines of the The Illiad and The Aeneid Whitman’s, “I sing the song of myself,” suddenly strikes one like a thunderclap. We see that Whitman means to destroy, or perhaps remake, the whole concept of epic literature. His exaltation of the “eternal now” of the individual has an enormous impact on how Americans think of themselves. You, the I, are now the epic, which brings us right up to social media today. But again, to what end? Hill hints at the potentially destructive impact of Whitman’s attempts to make the past obsolete, but never draws out the consequences for American diplomacy. Many Europeans argue, for example, that Americans act rashly without proper understanding of context and history, but Hill never addresses this. But now not just Americans, but much of the western world appears ready to formally and radically redefine the concept of marriage and family. What will this mean for our diplomacy as a nation, especially in sensitive areas of the globe that reject this redefinition as blasphemy? Hill compares the hopeful message of the Oresteia with American Eugene O’Neil’s recapitulation of the same themes in Mourning Becomes Electra. O’Neill rejects Aeschylus’ hopeful conclusion. Why, and to what end? Again, Hill offers us nothing. For someone so adept at drawing conclusions based on texts, and for someone so experienced in putting forth ideas and proposals, I cannot believe he lacks the ability to make grand strategic pronouncements. But Hill plays it very close to the vest and misses a great opportunity to share whatever wisdom he has. His great specific insights never come full circle. Similarly, Hill frustrated me by never questioning the logic of the state itself. He has high praise for the Peace of Westphalia, which in his view ended the cycle of violence from religion and clan and created the state. This parallels what happened in the Oresteia and the symmetry appeals to Hill and to myself. But has the state in fact limited violence? Maybe it has, but it should not be assumed. What problems come with the creation of states? Aeschylus assumes the good of the state as almost a given, but that’s understandable given his medium. Aeschylus also lived in one of the great golden ages of civilization, and the state no doubt shone brightly in its virtues in his lifetime. Hill has no such restrictions of medium, and has the benefit of the hindsight of history. He should have done more. Hill tantalizes in doses. The individual notes he strikes promise much. But he fails to deliver on the promise of his title. 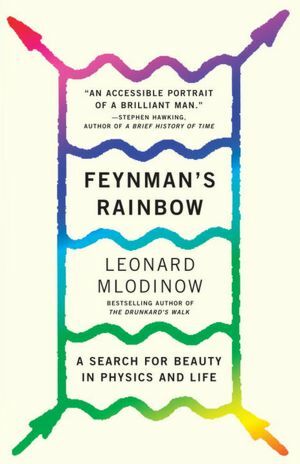 Every so often I enjoy switching gears with my reading, and I found my reading of Leonard Mlodinow’s Feynman’s Rainbow quite pleasant. I got introduced to a few scientific ideas, and some interesting insights into the brilliance and insecurities of the top physicist’s in the world. The Babylonians made western civilization’s first great strides in understanding numbers and equations, and in geometry. Yet it was the later Greeks–in particular Thales, Pythagoras, and Euclid–whom we credit inventing mathematics. This is because Babylonians cared only whether or not a method of calculation worked–that is, adequately described a real physical phenomena–and not whether or not it was exact, or fit into any logical system. . . . To put it simply, the Babylonians focused on the phenomena, the Greeks on the underlying order. Both approaches can be powerful. [“Greek”] physicists are guided by the mathematical beauty of their theories, and it has led to many beautiful applications of mathematics. The Babylonian approach lends itself to a certain freedom of imagination, and allows you to follow your “gut feeling” about nature, without worrying about rigor and justification. In fact, physicists employing this kind of thinking sometimes violate the formal rules of math, or make up a strange new (and unproven) math of their own based on their understanding of experimental data. In the book, Feynmann occupies our attention and captivates it. Gell-Mann’s extraordinary demand for rigor makes him a bit socially awkward, among other things (today would we consider him autistic?). But which is the right approach? I can’t say much about either approach in science, but historians come in Babylonians and Greek forms as well. Herodotus, the “Father of History” was “Greek,” but subtley so. Thucydides would have been “Greek.” Other “Greeks” might include Polybius, St. Augustine, Gibbon, H.G. Wells, Spengler, and Toynbee. But most modern historians react strongly against the “Greeks.” I strongly dislike some of the “Greeks” I mentioned (Gibbon for one) and love others. Where to take a stand? Well, the issue needs settled, and I thought I would write a Socratic dialogue to hash it out, with apologies to Plato. Babylonian (B): Before we discuss historical knowledge, I suggest that first we discuss the foundation of all knowledge, the knowledge of God. Greek (G): Agreed! An order of operations! How very Greek of you to suggest it. B: I concede the point, but we’re just getting started. You haven’t won yet. I argue that God cannot be systematized, and so knowledge of God will also lack a system. G: Yes, God cannot be “put in a box,” as you say. I agree that God is beyond a system. He is of course, Personal (and Beyond Personality), and so an approach to God that attempts to dissect via a formula will fail. B: Well if knowledge of the Highest is attained without a system, it follows that knowledge of lesser things, i.e. mankind itself, should also avoid systems. So “systematic” historians like Toynbee err in their approach. Ha! G: Another great example of Greek logic! I’ll have you yet. You would agree, I’m sure that reason has its place in life? G: No doubt you would also say that knowing God means going beyond our reason. B: I couldn’t have put it better myself. Now you’ve conceded the victory to me! G: Not yet . . . Knowledge of God is beyond our reason but is not against our reason. In the same way, God stands above our finite human capacity to fully know everything, but we do know some things. B: Yes – we know some things. But we have only a few pieces of the puzzle. We’re not God, you know, and so can’t create the rest of the puzzle out of nothing. G: Yes, but we’re not making it out of nothing. God has given us some things for us to know, and more than “some things.” He has given us knowledge of Himself! And He calls us to make sense of what we know. B: Agreed, but He calls us first to humility. Let us not overreach, let us appreciate the mystery. G: Let us also not be lazy. How can we make sense of what we know if we don’t give it some kind of order in our minds. You would have it so we know nothing besides isolated facts. And if all we know is isolated facts, then we really know nothing, for nothing can be known without context. But always in Scripture the authors draw conclusions based on what they know. One thing leads to another. B: And what are these conclusions? Are they a system? You said that “we give it some kind of order.” Just because “we” give it order doesn’t make it true. G: Ok, Mr. Babylonian, what can we know, then? Out with it! B: God reveals enough for us not to fall afoul — we have markers and signposts. We can know that we are in the right ocean. But we do not have enough eternal perspective to make systems of the signposts. We can’t know where we are in the vast ocean. G: But God’s commands surely make sense! Do not murder, for example. And Jesus “spoke plainly.” I once had a professor say that, “Scripture is shallow enough so a baby can wade and deep enough so an elephant to swim.” I grant you the elephant, but you throw the baby out. You think, Babylonian, that you’re all open and mystical for your approach. But actually, you’re more closed than I. I love the part in Chesterton’s Orthodoxy (which you know so well), where he describes how fences give us more, not less freedom. B: Do you suppose there will be such fences in Heaven? They are temporary expedients for finite creatures. The key word there is expedients. They are temporary, not eternal, and thus, not rooted in Truth. G: You see again that you cannot avoid an order of thinking. You will admit defeat soon, I hope. But if you wish to talk of finite creatures, let us do so, for History is primarily a study of mankind and only indirectly a study of God. B: Yes, for it here that you will meet your match. G: Oh? Let us leave aside to what extent God can be known for the moment. But you and I are both men. And we know each other. Finite man can know something about himself, surely? B: Oh yes, he can know something. He can know enough to know He is a mystery. All this modern talk of “looking within yourself” has given us not just terrible Disney movies, but also a terribly confused generation of people. G: Don’t you try and link me to those wretched movies! But yes, man too is a mystery. But imagine a man driving down the road. He reaches a fork and can turn right or left. He can know why he turns one way or the other, and he can communicate that to us. B: No — not even he would know all the reasons for his choice. He might delude himself into thinking one thing and it’s really another. And if he can’t really be sure, what can he tell us? If he can’t tell us, how can we know? G: You confuse the issue again. In a purely individual and isolated case you may be right. But the “Greek” historian never deals with such isolated moments in time in a vacuum. He has a whole field of action at His disposal. Like in physics, each atom has lots of empty space and unpredictability, but if you put a bunch of them together, you can build bridges. Because you can build bridges doesn’t mean you know everything about matter, but you enough to consistently build bridges. So too with people. Yes, mystery exists in humanity. But we know something of what it means to be made in His image. We know something of what it means to sin and fall short of the glory of God. We can observe thousands of years of human activity and see that we tend to act in certain ways in certain times. B: Yes, but you, “Mr. Look at me I’m so Open to Everything,” are closing God out of the picture. Supposing God steps in to change something? That alters your equation. And God may intervene and we would not know if He did or not. So how can we really predict? How can we create any system at all with an actual “God in the machine?” What we can do is stand back and admire the mystery. G: Well how does God work then? His intervention does not make men non-men. God is always there — “in Him we live and move and have our being.” But He does not take one thing and make it another. So we are still studying “mankind,” in every case, when looking at History. Look at Pharaoh. Yes, God hardened his heart, but He did not fundamentally alter Pharaoh’s character. B: “He does not take one thing and make it another?” How about changing water into wine? How about making a dead man come alive again? G: Well, water is a vital part of wine. And in raising Lazarus, he raised Lazarus, not some new and different man. The Church rejected gospels where Jesus’ miracles seemed random or non-sensical. God gave us brains to use them. If He directly intervenes He will do so to enhance our understanding, not confuse it. This is why we need “Greek” historians. B: But Greek historians are always wrong at least in part. Toynbee’s last volume of A Study of History retracted and corrected parts of his earlier work. You can say, “No one is perfect,” but that’s the point. No system works perfectly because no man works perfectly. If we know it contains errors, what value can it have as a system? G: Toynbee showed the very humility you seek in his retractions. But I won’t argue for any particular system. Instead I’ll claim victory on your own turf by looking at any individual man. In truth, we all practice a form of “Greek” history all the time in our daily lives. We interpret and synthesize from our experience. We must, for we cannot view life as random and seemingly meaningless. Without this continual synthesis, no one would gain any wisdom. And you must concede God calls us to gain wisdom? B: But wisdom is not a system. G: Agreed, but . . . it is a form of synthesized and applied general knowledge, and that, my friend, clinches it. B: And so this means that I’ve lost? G: Yes, but you lost right away, as I told you, when you rightly imposed an order of how to think about the question. G: Victory! I am so smart! What about Babylonian and Greek science? Shall we debate that? No. I would look even more silly than usual. But if I wrote it I would give the victory to the Babylonian, or at least for the moment. Do we even know what matter is? Are we even sure that matter, if we define matter as an irreducibly small and purely physical entity, even exists? Here the Christian may have more caution in imposing a system, at least for now when our knowledge remains quite incomplete about the most basic things. Perhaps I should slightly temper my affection for the “Greek” historian. But in the end, I will side with Herodotus, Thucydides, Polybius, St. Augustine, and the like even if it means inviting Gibbon to the party. In 1893 Frederick Jackson Turner changed our study of American history with a speech to the American Historical Association entitled “The Significance of the Frontier in American History.” His talk helped propel him to national prominence. But naturally all that attention also made him a target for criticism. In his speech Jackson proposed that the concept and reality of the frontier had done more than anything else to shape American history and American consciousness. As the frontier disappeared in the late 19th century, he argued we might expect to see a new phase in our national development. Jackson begins his speech by defining the frontier as the boundary between “savagery and civilization,” and states that the American frontier differentiates itself from other places by lying at “the hither edge of free land.” In the days of earliest settlement in the 17th century, the east coast formed the frontier of Europe. Then, as our national identity took shape, areas in the west became our own frontier. While initially the French rather than the English engaged in the most direct trading with Indians, Turner argues that the trading trails themselves inevitably drew English colonial civilization westward. Trails to sources of salt (used as a preservative) then assumed vital importance, leading to a still more inexorable march of civilization. The Old Dominion has long been celebrated for producing great orators; the ablest metaphysicians in policy; men that can split hairs in all abstruse questions of political economy. But at home, when they return from Congress, they have negroes to fan them to sleep. But . . . a western Virginia statesman, though far inferior in logic and metaphysics and rhetoric to the old Virginia statesmen, has this advantage, that when he returns home he takes off his coat and takes hold of the plow. This gives him bone and muscle, sir, and preserves his republican principles uncontaminated. This may give us a clue as to why we never had any success regulating frontier expansion. We attached the frontier so strongly to our national identity that to go without a frontier meant repudiating ourselves. Or perhaps, as Turner suggests, the frontier functioned as a “safety valve” for the landless, the immigrant, the economically distressed. Without this, democracy might tend towards eating itself from within. In the absence of an external threat or safety valve, Turner surmised that democracy might turn into a mere vehicle for discontent. The self-reliant virtues that made us great would weaken us when we turned inward. Nicias must not divert you from your purpose by preaching indolence, and by trying to set the young against the old; . . . The state, if at rest, like everything else will wear herself out by internal friction. Every pursuit which requires skill will tend to decay, whereas by conflict the city will always be gaining fresh experience and learning to defend herself, not in theory, but in practice. My opinion in short is, that a state used to activity will quickly be ruined by the change to inaction; and that they of all men enjoy the greatest security who are truest to themselves and their institutions even when they are not the best. There exists however, the opposite theory. Some argue that the rapid expansion of republics, and not their “rest,” that leads to a “time of troubles.” In the example above, for example, the Athenians did not rest, did attack Sicily, and this led to catastrophic disaster. Or we might bypass the question somewhat and declare that the problems experienced by Rome and Athens are human problems and not particular to democracies. In any case, this question needs further thought. The introduction to the essay explained Turner’s influence, and also his critics. I have no problem with such a bold idea as Turner’s drawing criticism. This is the purpose of bold ideas — to inspire conversation. What I have a problem with is the nature of some of the apparent objections. Some complain that Turner should have devoted more study to the period after the closing of the frontier. But this seems silly. He studied one particular period, and not another. Not studying the time after the closing of the frontier doesn’t mean his ideas are false. I can’t stand these kinds of objections. Turner only claimed that the frontier explained the heart, not the whole body. To say, “You never mentioned southern agrarians” is entirely without meaning, unless one means to say that Southern agrarians form the key to understanding America. Otherwise all you’re doing is whining that someone didn’t say something about your own pet field of study. It’s not an argument. We should do better than this. I also mistrust the argument that no “heart” of American history can be found at all. In this vein, Turner’s thesis is false by definition, and again, not proved wrong via an argument. This declaration sounds like a rejection of History itself. Such people may be old and grumpy long before their time, or perhaps they resent the mere effort of trying in the first place. For if those that try to find meaning happen to do so, others who reject it might feel threatened. 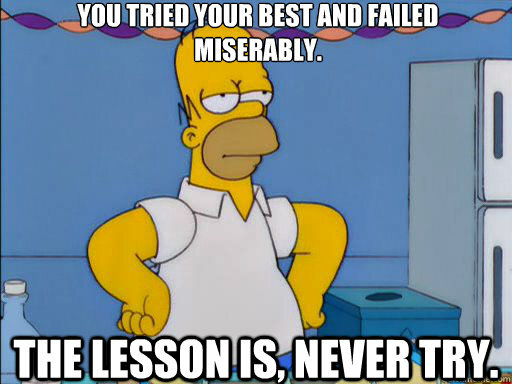 Such people would appreciate Homer Simpson’s advice . . . I think any biographer of Pascal has a difficult task. Brilliant, ill, and aristocratic, Pascal lived much of his life up in his head. The Abbe Jean Steinmann does a passable job with his life, though I found myself bored at times and skipped or glazed over portions of his work. I do give Steinmann credit, however, for bringing out some of the remarkable aspects of Pascal’s mind. The 17th century witnessed an intellectual explosion that has no equal afterwards. A list of intellectuals from that time still should dizzy us — Newton, Descartes, Hume, Hobbes, Galileo, Leeuwenhoek, Boyle — the list could go on and on. We talk flippantly about the “pace of innovation” today and yet surely we can’t begin to hold a candle to that era. 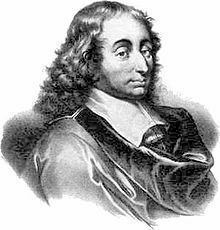 While I have no familiarity with most of the names on the list of 17th century notables, Pascal stands out to me as the most passionately Christian of the lot, and he was no slouch with math either. He invented the calculator and gets credit for advances in projective geometry and probability theory. Having not read it all, the book gets no full review, but it did inspire a few thoughts. . .
Euclid had a profound impact on Pascal’s early life. One might almost say Euclid “inspired” him. Euclid got Pascal to see the world and use his mind in wholly new ways. I know that Abraham Lincoln also had a similar experience with Euclid. When we consider that every major intellect probably from the Renaissance onwards cut his (or her) teeth on Euclid, we might surmise that perhaps only Plato and Aristotle have had more influence from the ancient world. Over the last few years I have often heard comments like, “We should learn to read the Bible as literature,” or “We must learn to see the poetry in theology.” I concur with both sentiments and applaud the drift away from viewing Scripture as a list of isolated proof texts. But I never hear how math or science should impact our theological thinking. Some use science to “prove” aspects of the Bible, but I have yet to hear someone show how thinking “mathematically” can help you think theologically. This is unfortunate, and perpetuates misperceptions about math and science. If God invented both literary and scientific minds surely both lead to him, not just in the details, but in the “big picture” as well. Enter Pascal, whose wonderful imagination (good for lots of things besides literature) led him to make theological conclusions based on his genius for math and science. Pascal argued for the idea of vacuums, against much of the establishment of his day. But he took the issue further, arguing for the infinite divisibility of matter, which then became a springboard for the proper place of reason in faith. We see him use math in other ways, such as the “spiritual perfection” of numbers showing the fallenness of the world. For Pascal some things are simply just self-evident and beyond reason, but his “math sense” led him to these ideas. Whatever we think of some of Pascal’s conclusions, if we taught math as Pascal learned it, I think we would see math and science rejuvenated, and our theology enriched. Pascal’s illness meant that he lived only a few short years after starting to take his faith seriously. We need not call it a “conversion experience,” but clearly Pascal had some kind of experience in the last few years of his life that intensified his faith and changed his life. Some see Pascal rejecting reason, math, etc. in his latter years. I wouldn’t go that far — I would say that Pascal may have been going through a recalibration period that tragically got cut short by his death. I wrote elsewhere about the concept of dominion and I will try not to repeat myself too much. The Pensees have brilliant insights, but they lack a fullness that you see in more mature Christian thinkers (granted, of course, that it was very much an unfinished work). Pascal’s brain (and his heart) burned at fever pitch. I don’t blame Pascal for this. Had he lived longer I’m sure he would have written something monumental and deep. As it is, of course, the Pensees are a classic, but Pascal did not have enough distance from math and reason to welcome it back fully into his thought, this time in the proper place. For example, he wrote that, “Curiosity is only vanity. We usually only want to know something so that we can talk about it.” Surely this is too harsh. Those who want to talk about their discoveries might do so mainly with the intent of enjoying them further, for enjoyment increases when we share it. Pascal seems a bit too jaded, a bit too sure of himself as a “new convert,” and this portrait of him shows that he may not have been at home with himself either. But all in all Pascal’s life should strongly encourage the right brained that yes, they can do more than defend Creation by design. Their mathematical insights can give rise to profound truths about the world. *Alas, Steinmann fails to mention how Pascal did this, just that it happened. Maybe he expects us to figure it out on our own, like Pascal. ^ Some great quotes from Pascal . . . When a soldier complains of his hard life (or a labourer, etc.) try giving him nothing to do. Jesus is a God whom we can approach without pride and before whom we can humble ourselves without despair.